Teacher Carts with whiteboards make it easy to store, transport, and organize all of your teaching supplies in a convenient, mobile design. Improve your Teacher Cart with removable bins and drawers to keep books, Whiteboards Supplies, and other classroom supplies in. If you�re looking for more space for books, check out the Book Carts that can accommodate these Book Tubs! 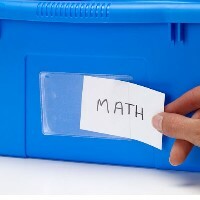 Make it easy to find what you�re looking for by applying adhesive name labels for schools on the tubs. Substitute these Book Tubs as Cubby Tubs in your Preschool Cubbies for easy storage of naptime and home items. Eco-Friendly Bins for Eco-Friendly Teaching Easels on wheels help improve your classroom�s Carbon Footprint. Check out all of the Green Items that can make your room an eco-friendly, sustainable classroom!